What is an Infiltration Trench? Infiltration trenches are linear ditches that collect rain water from adjacent surfaces, and their highly permeable soils allow the water to quickly seep into the ground. How do they manage stormwater? As mentioned, infiltration trenches primarily manage storm water quality. Larger quantities of water shear off the land surface and move to the ditch. Elevated banks are usually included on the sides of the trench to allow the water to pool, but not overflow. Once the water is collected, it begins seeping into the highly porous soil. The soil particles act like a sieve, preventing larger particles from moving downward with the water. Simultaneous, microbial biofilms present in the soil digest the organic pollutants. Infiltration trenches also reduce the amount of stormwater that would enters the sewer system and ultimately go to a treatment facility. It does this by storing the water in the soil, which acts as an underground reservoir, until it can percolate down and recharge the water table. Are there any other benefits to using Infiltration Trenches? The primary benefits of the infiltration trench are water quality treatment, reduction of peak flows in sewer systems, and groundwater recharge. Also, since the peak flow across the surface is reduced, the amount of surface water entering waterways is slowed down. This reduces channel erosion. The rain water enters the channels through the ground, providing the rivers with what is called base flow. Are there any constraints / design considerations? There are a number of important things to consider when installing a sand infiltration trench. The first issue is the permeability of the soil under the trench. Even though the first few feet of soil strata are engineered to allow water to flow through quickly, the soil type around the trench needs to allow water to travel at minimally 0.5 in/hr. Filtration systems such as this are prone to clogging with sediments suspended in the stormwater. Therefore the soil in the drainage area should not have large quantities of fine particles like silt and clay because they are likely to cause clogging in the filter. There are a few ways to pretreat the stormwater before it is collected in the trench. The simplest method is to have the stormwater travel over a grass strip because the vegetation removes some of the particles that are likely to get clogged in the trench. 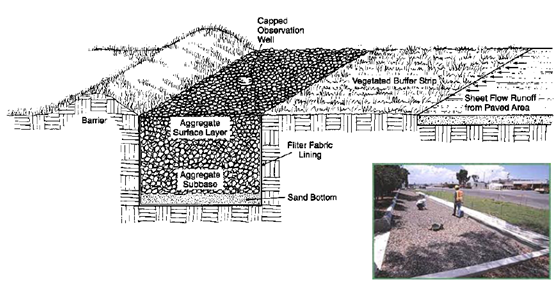 A second option is to include a plunge pool or some other type of miniature sedimentation tank. These structures collect water in a tank, and store it long enough to let particles sink to the bottom before the water moves to the infiltration trench. Sometimes the water propagates through the loose soil into groundwater so quickly that pollutants are not removed. If the polluted groundwater is pumped up for drinking water, those who consume it risk becoming ill. For this reason, infiltration trenches should not be constructed anywhere near public or private wells. Also, these trenches should not be placed too close to buildings as a lot of groundwater can cause basement flooding.